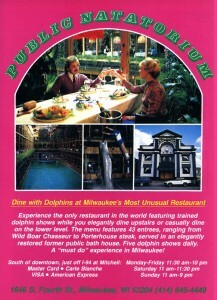 The Public Natatorium restaurant opened in the fall of 1979 and stayed opened until 1984 when it went into bankruptcy proceedings. It began with an idea by owners, John and Margaret Garlic to re-use an old Natatorium building for an interesting restaurant. 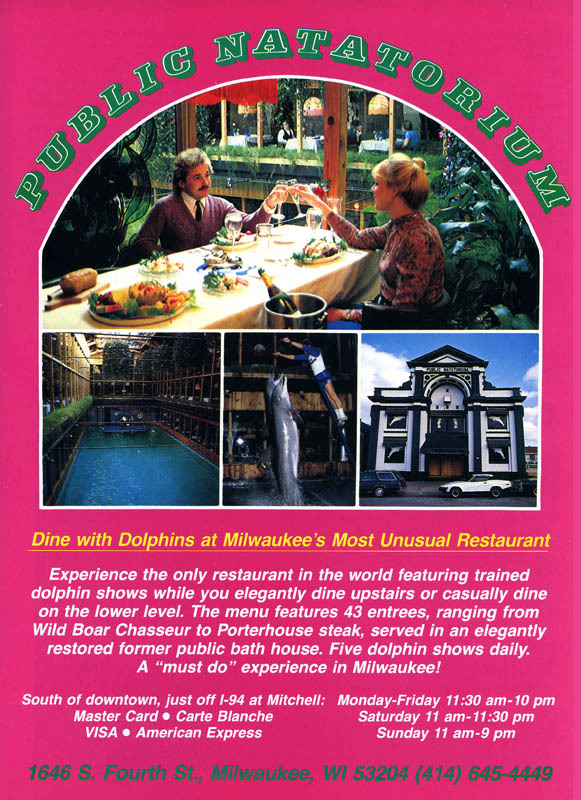 They used the old swimming pool to house dolphins and sea lions for performances to lure diners looking for a unique experience. Unfortunately as the business foundered during the winter of 1984, the animals were left in limbo without food and in danger of freezing. A federal bankruptcy judge had to step in to make sure the last dolphin was taken care of during the final days. The building was constructed in 1894 after a design by Eugene Liebert and finally was closed as a public swimming pool in 1977. I actually remember going to this place for Easter brunch one spring with my parents. If my memory serves me right, they had 2 dolphins and they were named, “Scotch” and “Soda”.. But I may be wrong. They weren’t the happiest of dolphins that’s for sure.. and think about it.. Do you think they bothered keeping the pool’s salinity correct? Sad to see it go because it was a very unique experience, however.. thinking back on it now.. it was pretty damn cruel to the dolphins. It’s one of those ideas for a restaurant that sounds great after a few drinks but in reality is really sad.